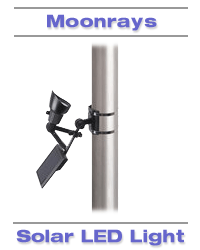 Illuminate flags late into the night with Moonrays' flagpole light. Completely adjustable solar panel and spotlight for optimum placement. The Moonrays solar panel gathers energy from the sun during the day and automatically turns on at night. When the batteries (included) are fully charged by the sun, they illuminate up to 10 feet diameter area for up to 8 hours. The light is made of black metal and plastic with a 50-lumen LED light that provides a 120 degree angle beam of constant light. The LED bulb remains cool to the touch at all times. The spotlight head adjusts for a maximum lighting angle and the solar panel swivels so that it can be positioned facing the sun. The light is securely fastened to your 3.5 to 5 inch flagpole by metal straps. Product Manufacturer: Coleman Cable Inc.